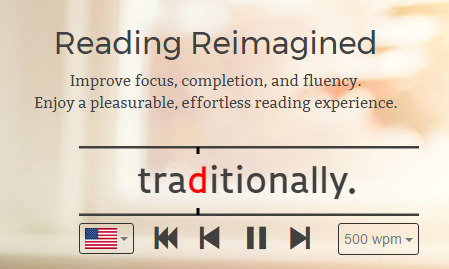 The average reading speed of an adult is just about 300 words a minute, which sounds impressive, but comprehension suffers as adults also tend to only retain about 60% of what they read —fix both with Spritz. The ability to be literate is something that humans have chosen to take on, a skill cultivated over thousands of years. While it likely had a very business-centric start in ancient goods ledgers, the ability to write and read has enabled us to get to where we are today. Every single day, the average adult sees hundreds of thousands of words, and that doesn't include anything they may read for pleasure. One of the biggest issues with reading cited by the critical is the time investment. Let's work on that, with Spritz. Spritz is software written by folks who want to change the way you read, and perhaps more importantly, the way you comprehend. By flashing a single word on the screen that is weighted to something called the "Optimal Recognition Position," or the ORP, Spritz can help your brain read easily up to 700 words per minute with just a little practice. Upon first try, Most people find that 500 words a minute poses no challenge. On top of being able to read at near super-human speeds, most readers comprehension goes up sharply as well. Spritz also helps those with dyslexia as well. The ORP is the letter our brains look for when we are reading, and usually is somewhere around the third or fourth letter for most words we read. The ORP, shown in red in most applications that use Spritz, changes based on the word length. In a three letter word, the ORP is directly in the middle. In longer words, the ORP is shifted further to the left. There's a ton of science behind the reason Spritz works, and if you're into it, we suggest you go check out Spritz' scientific breakdown. Or, if you're just curious about Spritz, you could always try it out for yourself. You can try it at Readsy.co, but we think Spritz is even better when you experience it on iOS. 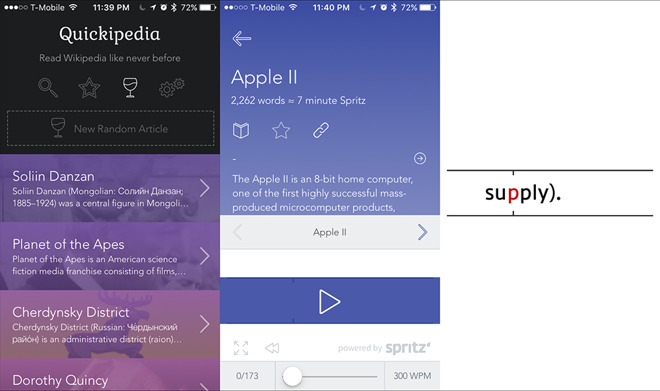 Here's our two favorite Spritz-based apps that we think everyone would benefit from. If you've got a classic book bucket-list that you're just dying to work through, we highly suggest ReadMe! ReadMe! 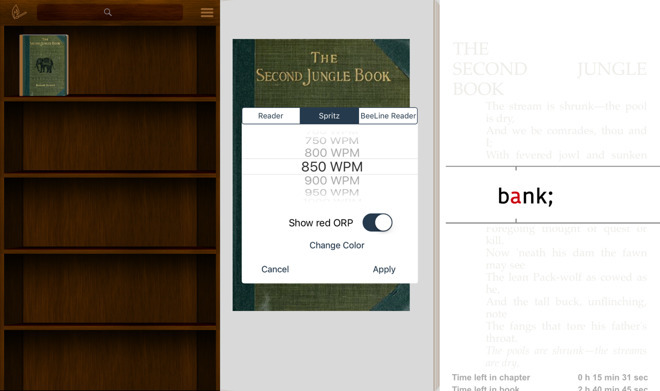 is a free app that allows you to snag eBooks and "spritz" them at up to 1000 words per minute. The app is easy to use and can work with existing books that you have that are in .PDF and ePUB formats. These are also the common filetypes used by Project Gutenberg, the internet's biggest collection of public domain books that you can download and read for free. ReadMe! also features BeeLine Reader, which is another speed reading and comprehension building software that utilizes multicolored texts to help readers zip through paragraphs with far more ease than usual. ReadMe! 's subscription also gives you the ability to sync your books across all your devices and also store where you left off Spritzing so you can pick right back up where you left off. The only caveat to this free app is that you've got to have an internet connection to use Spritz, unless you pay $5 for a yearly subscription which will unlock the "Spritz offline" mode. Wikipedia isn't always 100% accurate, but more often than not it's accurate enough and is a great way to help expand knowledge on everything from carnivorous plants to any given reality TV show and nearly everything in between. If you're a Wikipedia addict, Quickipedia is exactly the sort of thing we'd suggest getting. Quickipedia enables you to spritz articles at over 40 different speeds, features an easy to use layout, and even tells you how long an article will take to finish reading at the selected speed. Not sure what to read? There's a random article button. Want to go back and re-read an article you'd read before? Quickipedia remembers the articles you'd read prior. Out of all the Spritz apps that we've come across in the last few years, Quickipedia is quite possibly our favorite. Unlike Wikipedia, however, Quickipedia isn't free. You'll have to pony up $2.99 if you're looking to have this app on your iPhone or iPad. While there aren't a ton of apps out there utilizing Spritz, we hope that developers see how beneficial the creation of such apps could be. For instance, we'd like to see a newsfeed reader that utilizes Spritz to take the place of one that was pulled from the App Store in the last year. It's worth noting that you can't currently natively Spritz Kindle or iBooks just yet. If you want them to allow use of Spritz within their apps, you may want to suggest the idea to them yourself.